All NEWLY updated information is in GREEN TEXT below. Information still to be determined, or is in flux, is in RED TEXT below. Who should I contact should I have questions once I arrive at Wallops Island for the launch? We have 150 SSEP students, teachers, administrators, family members, and other stakeholders attending the launch of Orb-3, representing 8 SSEP Mission 6 communities: Washington, D.C.; Kalamazoo, MI; Berkeley Heights, NJ; Ocean City, NJ; Colleton County, SC; North Charleston, SC; Knox County, TN; and Somerville, TN. There will be 41 SSEP student researchers in attendance representing 8 of the 18 Mission 6 flight experiment teams. The SSEP Mission 6 Yankee Clipper payload of 18 experiments will be aboard the Orbital Sciences 3 (Orb-3) vehicle launching from Pad O-A, Mid-Atlantic Regional Spaceport (MARS). MARS is a commercial spaceport adjacent to the Wallops Flight Facility, on Wallops Island, VA, operated by NASA’s Goddard Space Flight Center. 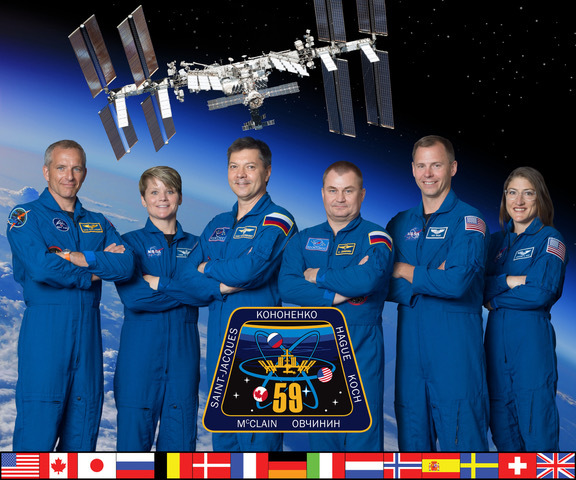 This page provides launch and travel information, the schedule of events, and guidance for participation by SSEP Mission 6 delegations traveling to the launch. Current plans are for SSEP delegates to be viewing the launch from Arbuckle Neck Road, which is 1.7 miles from Launch Pad O-A. By comparison, the Wallops Flight Facility Visitor’s Center, which is the primary public viewing site for launches, is located 7.5 miles from the Pad (see Map). SSEP delegates are invited to sit in on NASA and Orbital Sciences formal briefings to the media in the Visitor Center auditorium. These are the Pre-Launch Mission Briefing, and the Science Briefing (addressing the science payloads on Orb-3), both of which will be covered live on NASA TV. Note: children under the age of 10 will not be permitted in the briefings, and must be accompanied by an adult in the Visitor Center public space while the briefings are ongoing. a) Prior to launch, NASA has requested that NCESSE provide a special SSEP Briefing to the media, with SSEP student researchers providing an overview of their flight experiments (see Section D2 below for schedule details). The SSEP Briefing will not be covered live on NASA TV, however, we are hoping to arrange video-taping of the briefing. We do not know how well attended this media briefing will be, but this is the third launch where NASA has requested such a briefing. Prior briefings were well attended and led to SSEP inclusion in numerous articles covering the launches. NASA Wallops also believes that a few major networks may have crews on-site covering this launch. b) The expectation is that each of the student researcher flight teams will provide a short oral presentation on their experiment as part of the SSEP Briefing, and have a poster for display in the Visitor Center public space after the briefing (see Section E below). c) SSEP delegates are also invited to sit in on the NASA and Orbital Sciences Post-Launch Briefing, which will be covered live on NASA TV. The National Center for Earth and Space Science Education, and the Arthur C. Clarke Institute for Space Education have identified a dinner site where all SSEP delegates can come together in a social setting. The cost of dinner, however, will need to be covered by the delegates. It is an early dinner due to the launch schedule, and will be held at Wright’s Seafood Restaurant (see Section C.3 below), 3:30-5:00 pm on launch day, Monday, October 27. Dinner will take place after the poster presentations at the Visitor Center, and before travel to the launch viewing site. The Visitor Center is located on Route 175, six miles east of US-13 and five miles west of Chincoteague Island. It is a 60-minute drive south from Salisbury and Ocean City, MD and a 90-minute drive north from the Chesapeake Bay Bridge-Tunnel. Visit the driving directions webpage. Airports: Where should folks fly in? If you book online, Southwest offers Wanna Get Away non-refundable fares which are very reasonable. If you need to change your flight, there is no change fee, and you can try to get another cheap Wanna Get Away fare if they are still available. If not, you can get their refundable Anytime fare, which is still reasonable and likely the highest price fare you’d need to get. The Anytime fare for the same flight does not change as you get closer to the travel date. For a flight change you pay the price difference between the fares. That means you know right now what the likely worst potential added cost of a change would be. Also, the Anytime fare is refundable. So if you end up making a flight change from a Wanna Get Away to an Anytime ticket, but then end up not going to Virginia (say the launch is delayed yet again to a date you cannot attend), you can get reimbursed for the difference between the Wanna Get Away fare and the Anytime fare. You cannot beat Soutwest’s fare structure if you need to build into your thinking that the launch can slip—and you DO need to build that into your thinking. We have identified a number of hotels in the area. When booking a hotel, make sure to find out how close to launch you can still cancel without penalty so that you can assess what happens to your commitment of payment if the launch date slips before you arrive in Virginia. We have provided information below on several restaurants. Wright’s Seafood Restaurant is 5.2 miles from the Pad. The four other restaurants are on Chincoteague Island. We always advise delegations to fly in the day before the scheduled launch and to be as flexible as possible so that after you arrival if the launch is delayed by just one or two days, there is still an opportunity to see the launch if folks can stay in Virginia for a few days. We always recommend that delegations DO NOT fly in on the day of the launch given any delays along your travel route may cause you to miss the launch. During the SSEP Briefing, each team will be able to do an oral presentation where the total presentation time for an entire team shall be no more than 4 minutes, followed by at most 1 minute Q&A from the audience. Some important guidance for putting together your presentation: The presentation should include: the experiment title, an introduction to the team, the school, and the community; and should provide for an understanding of the experimental question to be addressed, how the experiment is designed to address that question, and how the experiment is conducted in the mini-lab. The presentation might also weave in some of these topics: what led the team to this experiment, what was it like to go through a real science competition across your community, what does it feels like to have a real microgravity experiment going to ISS on Orb-3? You also should thank key sponsors and individuals as you see fit, noting that this could soak up lots of time so do this sparingly. The presentation should flow as a story, told by all team members in turn. This can indeed be done in 4 minutes if student researchers tune the presentation in advance, and do multiple dry runs in advance. Going over 4 minutes can mean that another team does not present, or media do not have a chance to ask questions. In general, the oral presentation should not seem scripted, it should seem as off-the-cuff as possible. Like you are telling a story to a friend. Team members should not read from a paper, and the presentation should not appear as if team members memorized a script and are ‘reading’ it back from memory word-for-word to the audience. One approach to developing a presentation is to create an outline of the story elements – the chapters of the story you want to tell. Then write a few sentences for each chapter that capture in a concise way what you are trying to say. Assign different chapters to the team members, and have the entire team practice telling the story until it flows, and until it fits within the 4 minutes. If you have extra time, you can address additional points. If you are over 4 minutes, you can see if some more practice, or tightening the wording, or removing a section can get you to the 4-minute maximum. a) We would like to stress that each team MUST do multiple dry runs in advance of the briefing to ensure story flow, and that it can be done in 4 minutes. b) The presentation will done by the SSEP Researchers seated behind the dais on stage at the front of the room. 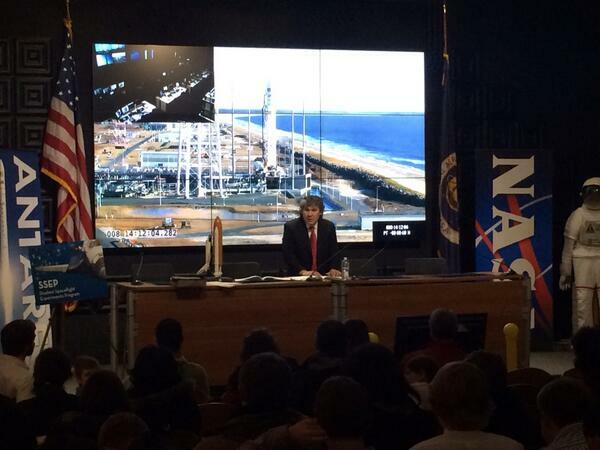 See photo at right of Jeff Goldstein starting the media briefing for the launch of Orb-1 in January 2014.
c) Only SSEP Student Researchers will be presenting; no teachers, administrators, or parents will be presenting. d) There is no AV available for the presentation, so there is no means to do e.g. a powerpoint. e) A presentation with multiple presenters should allow for equitable distribution of the 4 minutes across all presenters. Visitor Center staff will be setting up tables for poster presentations by the student flight teams. The idea is to give the students the opportunity to interact with both media representatives and the visiting public. The poster presentations are scheduled after the SSEP Media Briefing so that the media can follow up with more detailed questions on experiments of interest, and each student researcher team can go into more detail regarding their experiment. We recognize that for those delegations traveling by air, traveling with a poster board can be problematic. NCESSE will therefore make a poster board available to any delegation requesting one in advance. A straightforward way to create your poster presentation is then to print in color, and on good quality paper, before traveling to Virginia. On arrival at the Visitor Center, you can then tape your presentation to the poster board. NCESSE will provide transparent tape. a) all posters should look professional. b) The Vistor Center has the means to provide a TV monitor or DVD player if needed by a team. NCESSE will assess if any teams have a need for either. c) The 36 x 48 inch poster board NCESSE will make available on request is the following Staples product. NOTE: we request that all teams providing posters leave them behind in Virginia, so that the Visitor Center can continue to display them as long as they feel it appropriate.